If I mention the word Peru to my boys, they automatically think of and say Paddington. Who can blame them? Paddington has become one of most loved small bears around the world. However, I would love one day for them to think of Peru as the mysterious, magical, special place that I discovered a few years before they were born, rather than a place where they think you eat marmalade sandwiches. I'm continuing my 'A Place I'd love to return to with the kids series' with Peru. If you missed the first post in the series you can read all about our trip to Easter Island, and why I'd love to go again with the boys. My fascination with Peru, apart from loving Paddington Bear, was fired by watching Michael Palin’s Full Circle in the late 90s. Although he went to Cusco, Machu Picchu and the Sacred Valley, it was and still is his filming at Lake Titicaca that stands out in my mind. When we visited, there was an International Peruvian footballer playing for Newcastle United at the time. We took with us an NUFC shirt and the topic of Nolberto ‘Nobby’ Salano became a great talking point with the locals. 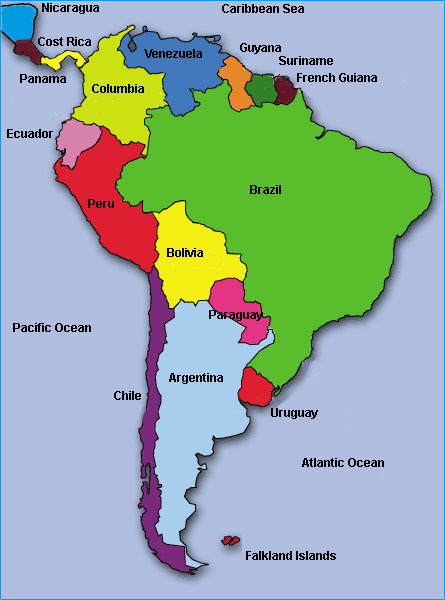 Peru is a country in South America, sandwiched between Bolivia and Chile to the south, Equador and Colombia to the north and Brazil to the east. The west coast lies on the Pacific Ocean. It is a land of many different climates. The Andes mountain range run parallel to the Pacific, an ocean whose currents also gives Peru a large diversity of climates, as the country also has desert and rainforest too. The population exceeds 30 million and the most spoken language is Spanish. Over 65,000 British people visit every year. The history in Peru can be dated back to 9000 BC, however, it is the powerful Inca Empire which emerged in the 15th Century and the Spanish colonisation of the area in the late 1500s that have made a lasting impression on the country, and is what I mostly have remembered from our trip. 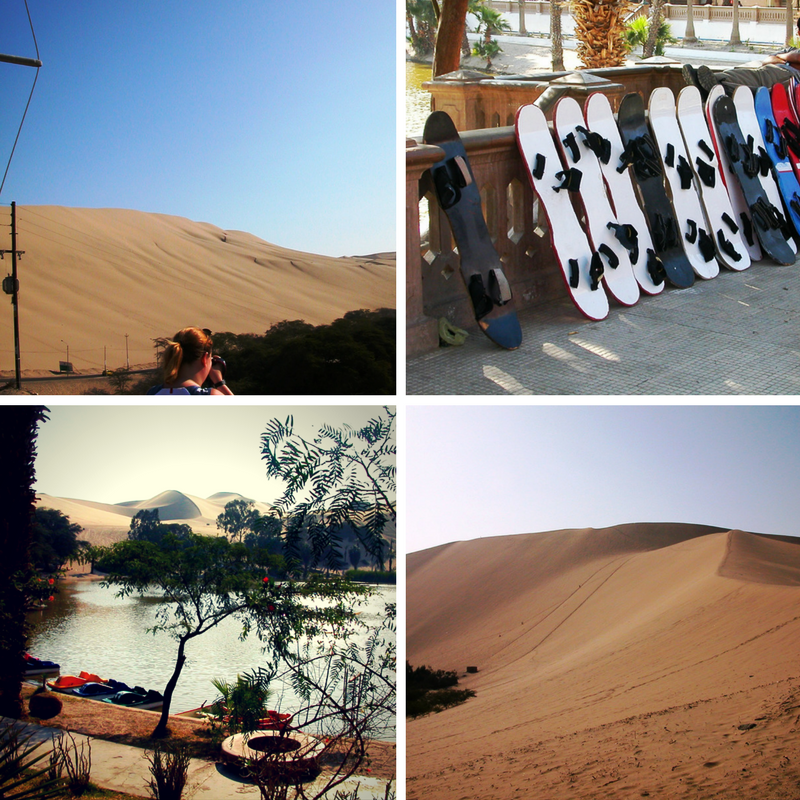 Our two-week holiday took us to the capital city of Lima, Cuzco, the Sacred Valley, Machu Picchu, Lake Titicaca before returning to Lima from where we booked an additional trip south to Ica and the amazing Nazca Lines. 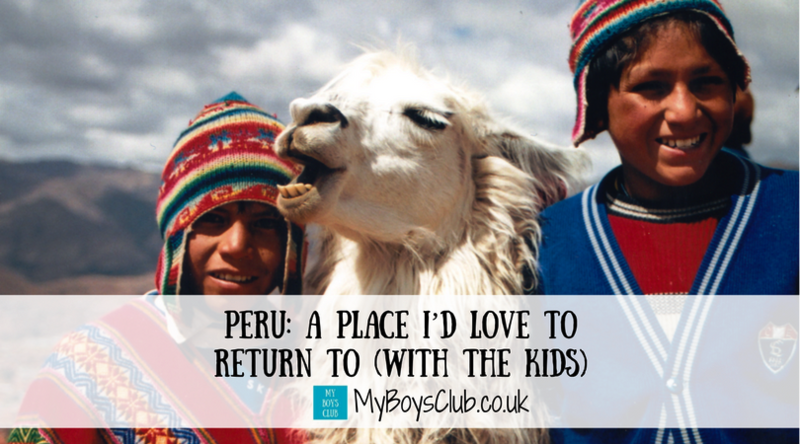 Here are the five most memorable places from our trip to Peru, and where I think the boys would absolutely love. We flew with KLM to Peru, via Amsterdam plus a fuel stop in Bonaire, which took over 16 hours. This is still the longest flight I’ve taken in one go. Our first point of call, as it is for many tourists, was Lima, the capital city described by Lonely Planet as being a city, that is colonial cool. We stayed in the popular district of Miraflores. 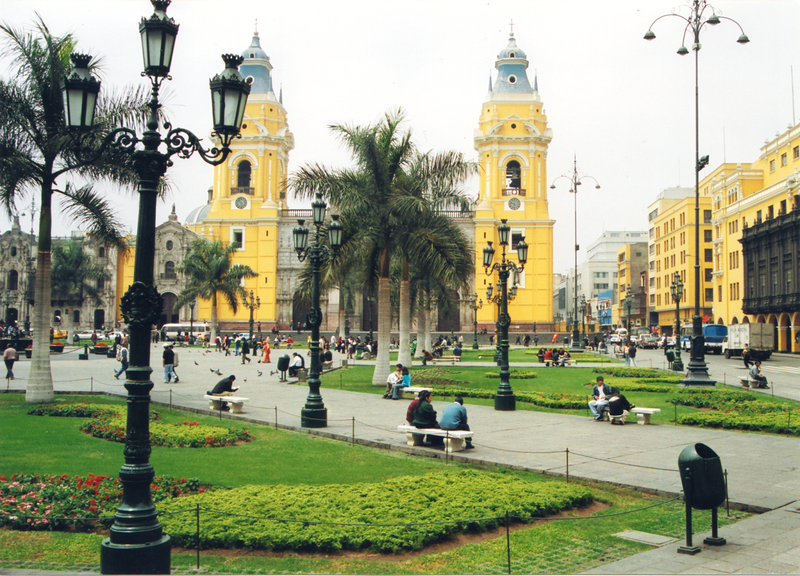 Lima is an elegant city, with some stunning architecture, and manages to blend its traditional Peruvian heritage with modern day living. We took in the sights, stunning buildings and architecture, and ate some incredible food and drink. That was one thing that hadn’t really been on my radar before we arrived. Parts of the city, especially along the coast reminded me of Barcelona too. At 11,152 feet or 3,399 meters above sea level, I can safely say Cusco is the highest place on earth I’ve ever been, with two feet on the ground! We had read about altitude sickness before we travelled, and that it can be worse when arriving by plane (and yes we did that) so was it really that bad? Ten years later I can still remember how it felt, constant wooziness, a dull headache and an inability to do anything too quickly - but a good few cups of coca tea and some sleep and within a day or two we were fine. The former Inca capital of Cusco itself is beautiful, high in the Andes it sits at the top of the Sacred Valley and is the gateway to Machu Picchu for most travellers. 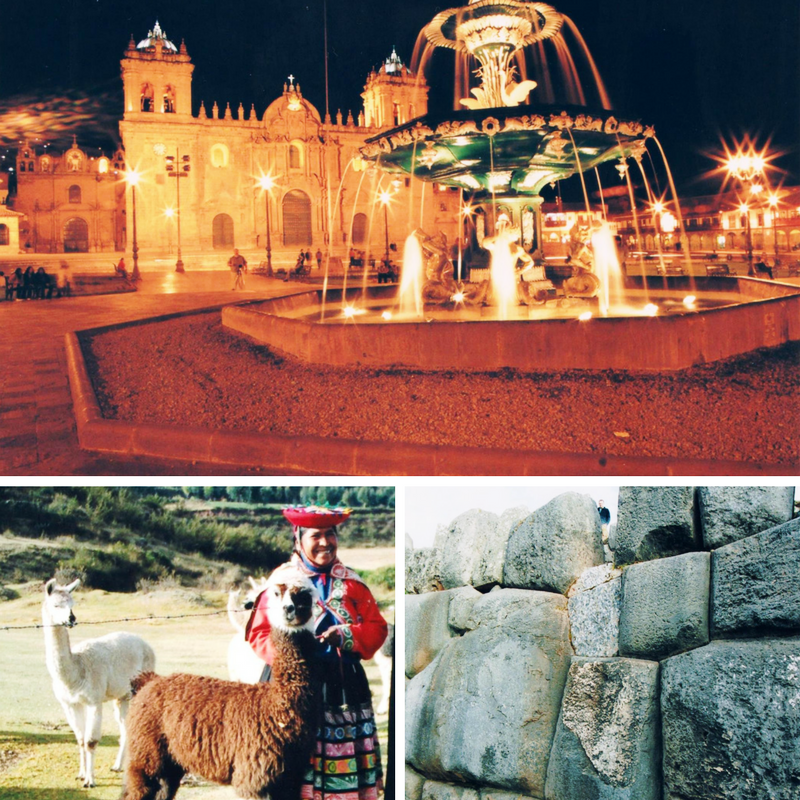 In the town, you’ll find plazas, ornate cathedrals, Inca temples, cobbled streets, women in traditional dress (skirt and bowler), and alpaca knits, jewellery and trinkets on sale everywhere. It is also surrounded by many archaeological sites, all worth a visit. 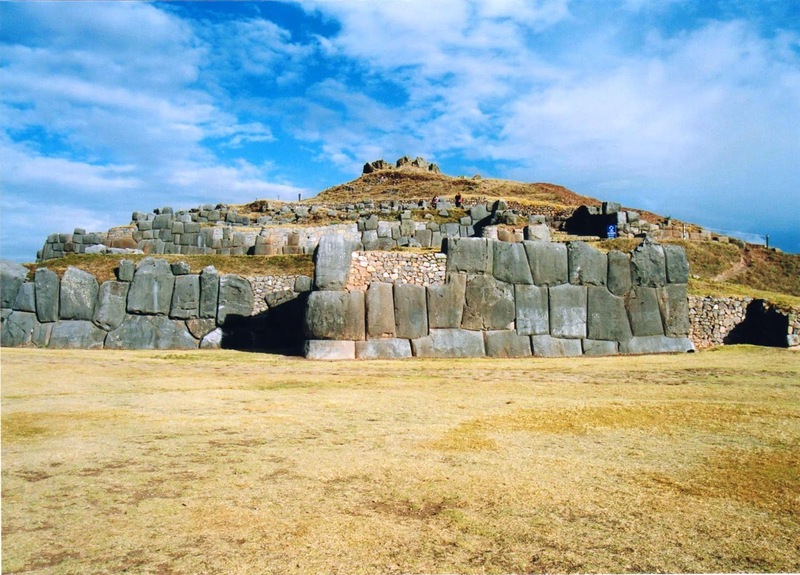 This includes Sacsayhuaman, a stone citadel which lies on the northern outskirts of Cusco. It was the largest construction of the Incas and is famed for its remarkable large dry stone walls with boulders carefully cut to fit together tightly without mortar. The stones weigh up to 200 tonnes, are so closely spaced that a single piece of paper will not fit between many of the stones. They are a marvel to see and have puzzled scientists for decades about the precision with which it was built. 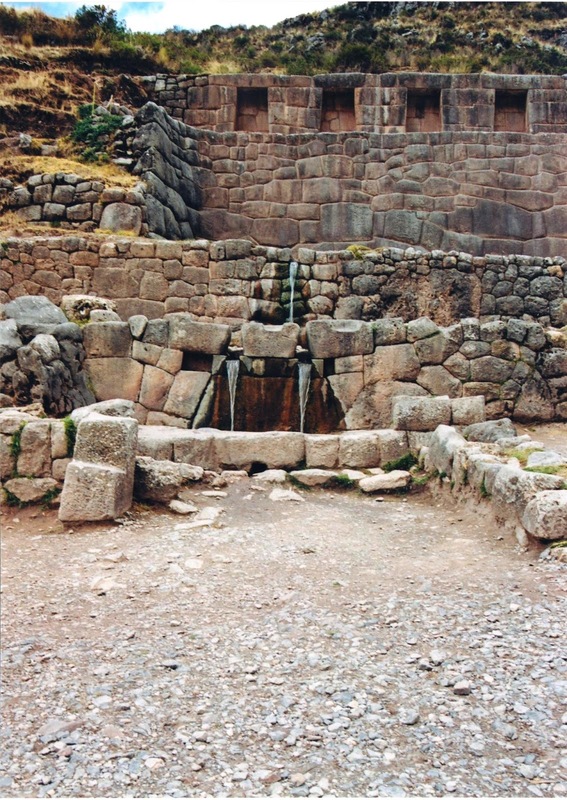 And the Inca baths of Tambo Machay. Situated at a spring, the ruins consist of three tiered platforms - one with seating, below which underground water emerges to cascade to the lower level. It is thought it was a site for ritual bathing, used for ceremonial occasions for people of higher nobility. Peru’s fascinating Inca history is on display right before your eyes throughout a trip through its Sacred Valley. There are amazing panoramic views of the Río Urubamba Valley on the way to Pisac, a hilltop citadel known for its unique agricultural terracing, where you’ll find Inca ruins as well as bargains in the famous market. Further on is the ancient ruins of an Incan settlement and agricultural terraces at Ollantaytambo, which include an impressive fortress and temple. We learnt about the Spanish defeat of the Incas as we marvelled at the remnants of a once vast and powerful empire. 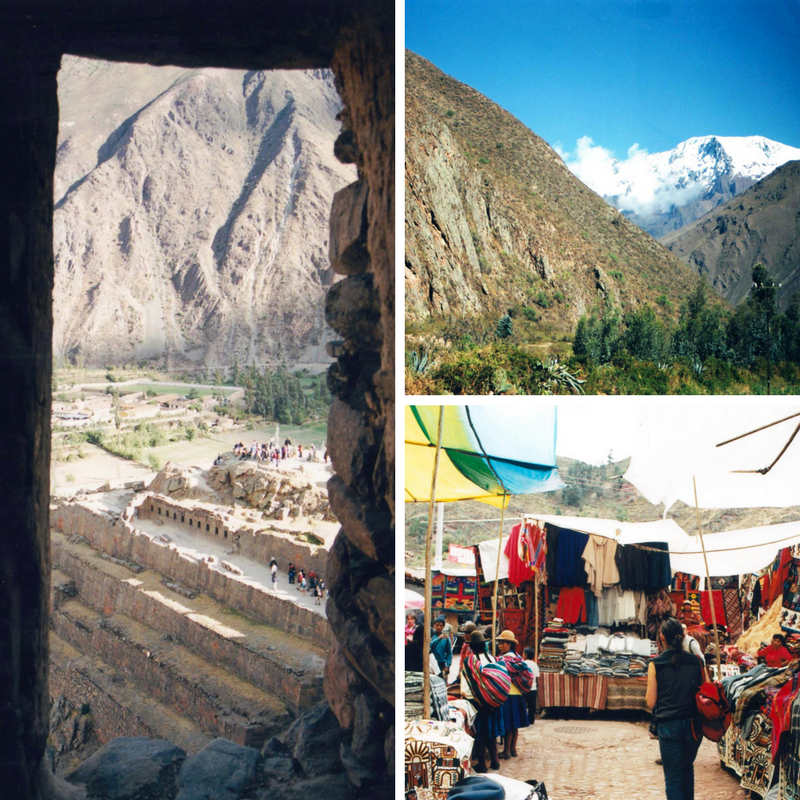 Ollantaytambo has some of the oldest continuously-occupied buildings in South America. Once a stronghold of Inca resistance to Spanish colonisation, it's remarkably well-preserved. This all leads to Machu Picchu. 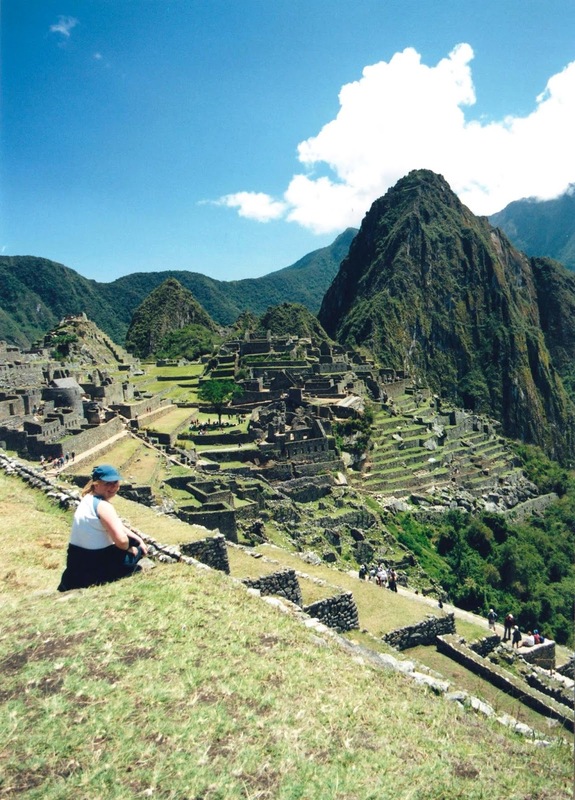 We travelled by train but you can walk the Inca Trail to Machu Picchu, which is Peru's most-visited site. Either way, you enjoy stunning views. 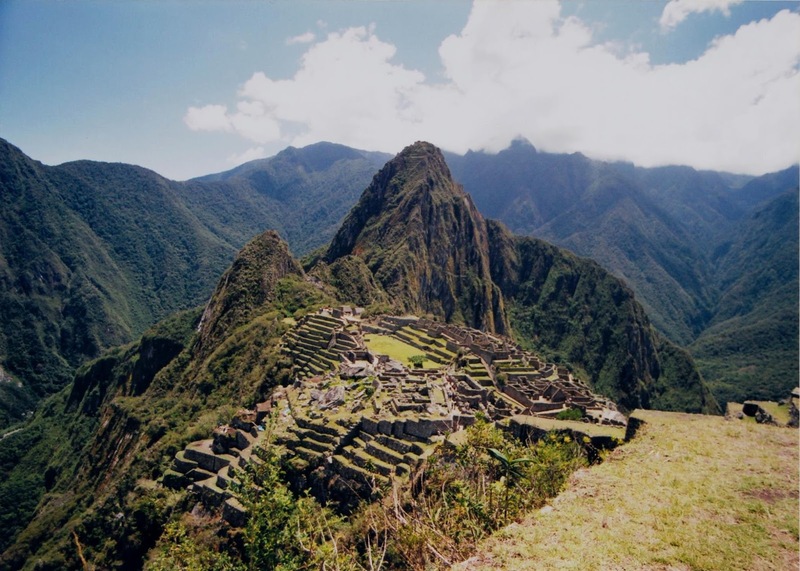 Dating to the mid-1400s, Machu Picchu is an ancient Incan city high in the Andes mountains. And is a place that does not disappoint. Shrouded in mystery, and sometimes mist, it really is a place that cannot be described accurately. Words do not do it justice. It is a place that needs to be seen. Experienced, And then remembered. We just took in the amazing views, ambience and aura. We sat under the tree in the centre for quite a long time. In the shade from the bright sun against a clear blue sky, relaxing. Even with so many tourists visiting daily it is one of the most peaceful places I have ever been. 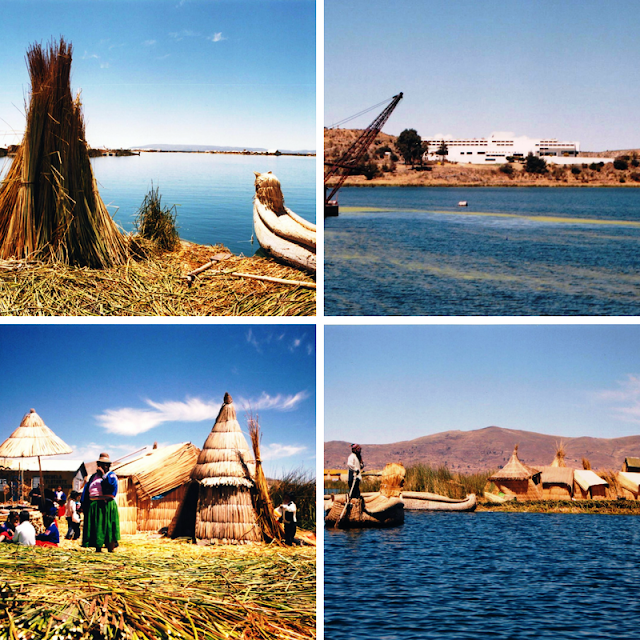 Lake Titicaca, according to Andean belief, is the birthplace of the sun. 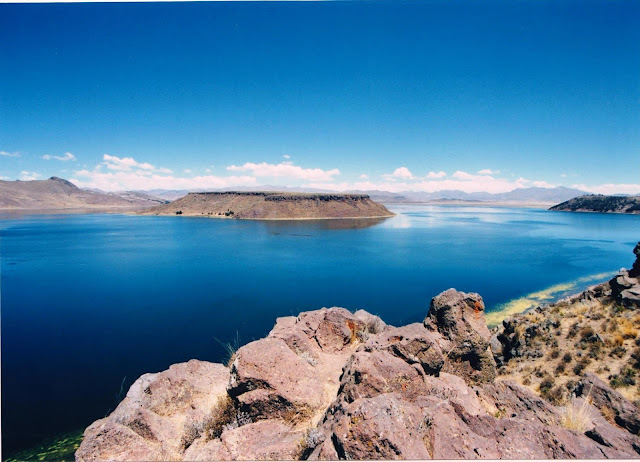 Spanning the border between Bolivia and Peru, it is also not only the largest lake in Peru but also South America, and at over 3,800m is also the highest navigable body of water in the world. We travelled again by train to Puno on the shores of Lake Titicaca from Cusco. And what a train journey it was. 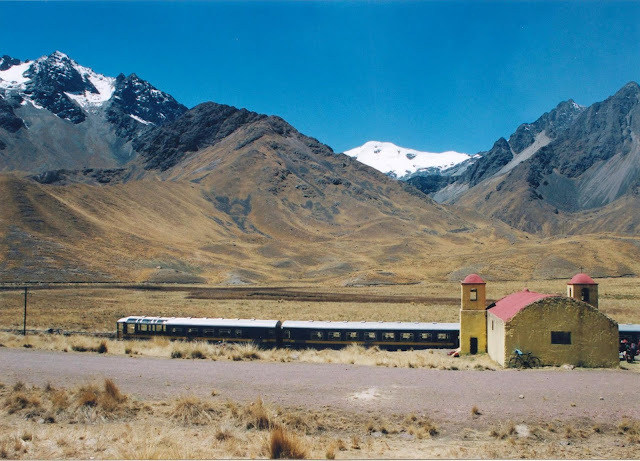 As our very comfortable train (we were sat in plush armchairs) gently climbed through cooler and higher altitudes, through the magnificent Andes, and past the Huatanay River, stopping at La Raya, for an unmissable photograph, which is also the highest point on the route. The whole journey took 10 hours during which time we saw wondrous scenery, lots of wildlife and everyday life continuing to happen as we watched people wash their clothes in the river. 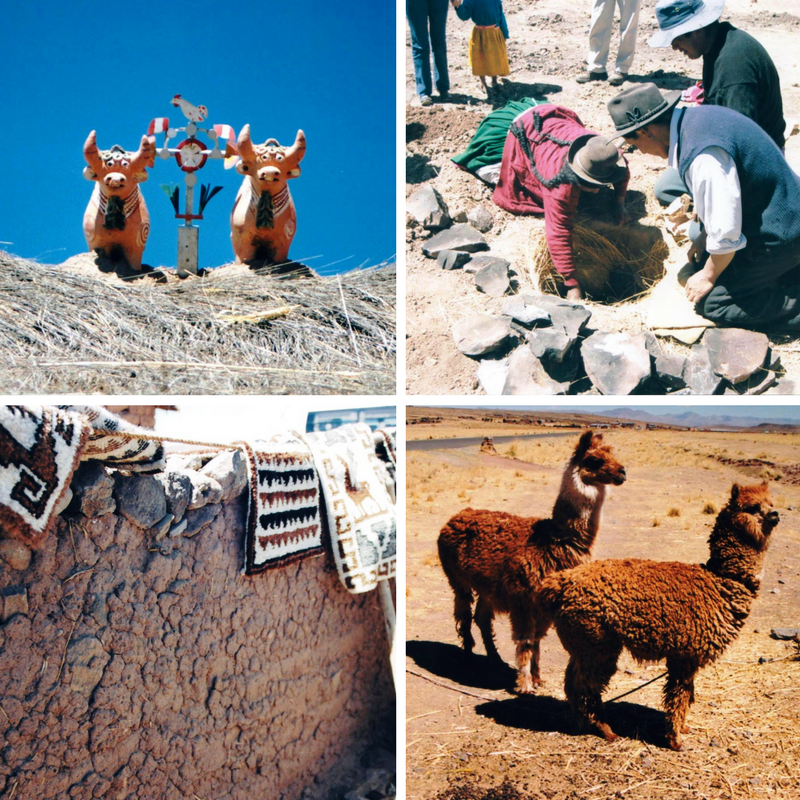 Once at Lake Titicaca we took in the amazing views, had a boat trip with a difference and visited some of the nearby villages where we baked a potato underground, saw hundreds if not thousands of llamas and alpaca and also wondered about the fascination for guinea pigs. At this point, I hadn’t realised that it was a Peruvian delicacy. One time I was very glad that I was vegetarian and had a limited menu to choose from. Our hotel at Lake Titicaca was shaped like a ship, however, it was a much smaller boat that took us on our visit to the floating islands made of Tortora reeds. The Uros people still live on the islands. Many years ago they were forced to take up residence on the floating islands when the Incas expanded onto their land. They use the reeds to make their homes, their furniture, their boats, as well as the islands they live on. 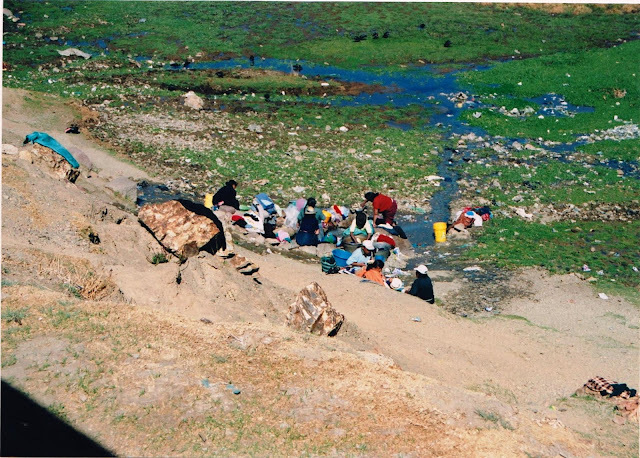 Despite the traditional lifestyle, the Uros people do have modern amenities. Some families have motorboats or solar panels. They told us that many younger people choose to leave after being able to see, via technology, what the rest of the world can offer them. Those who choose to remain supplement their fishing income by selling handmade crafts. I still have my miniature reed boat! Two hundred miles south of Lima are the bizarre Nazca Lines, whose existence have mystified everyone since their discovery ninety years ago. 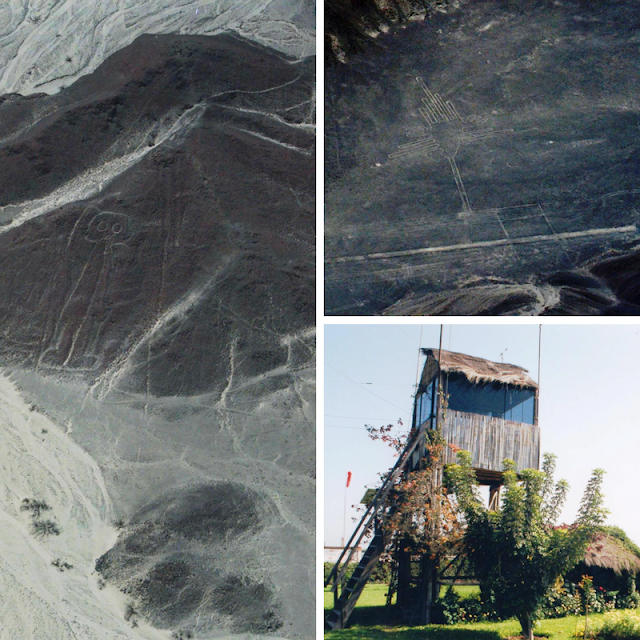 They are ancient geometric lines that crisscross the Nazca desert, accompanied by enigmatic animal geoglyphs are now a UNESCO World Heritage Site. 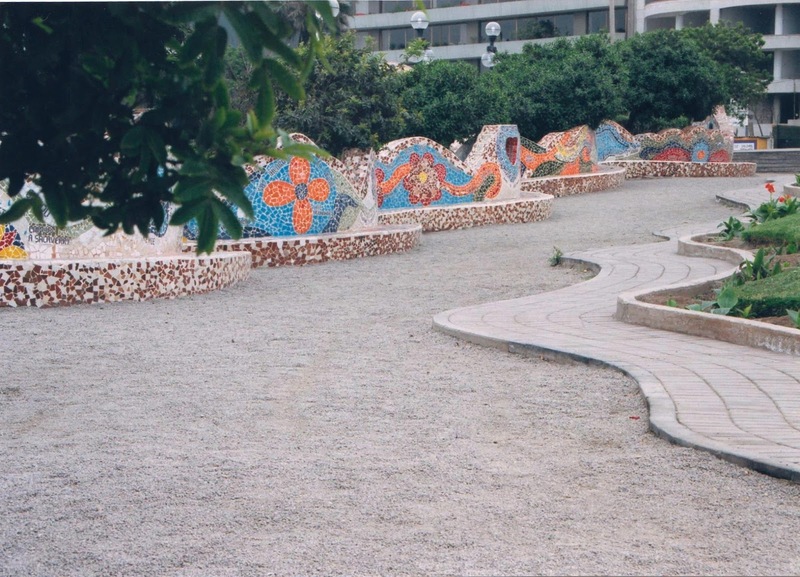 Comprising over 800 straight lines, 300 geometric figures and 70 animal and plant drawings, they are too big to be seen properly from the ground. Negating the fact that in order to preserve them no-one is allowed to walk on them because they are best viewed from the air anyway. You also take off from the smallest airport I have ever been too, where air traffic control is a wooden hut on stilts! Thought to have been made by a pre-Inca civilization between AD 450 and 600, they are huge and from the skies they resemble a lizard, monkey, condor, hummingbird, spider and one I like to think is a spaceman, but thought by some to be a priest with the head of an owl, spread over 500 square km of arid, dry rock. Pictured below the spaceman is 30 metres high and the hummingbird is 93 metres long. I have no idea why or how they were even created. What I do know is that this man-made elaborate art is a sight I will never forget. And just when I thought I’d seen it all we discovered the oasis resort of Huacachina, which offers both relaxation and white-knuckle thrills with sandboarding on the highest sand dune in the world – Cerro Blanco – dubbed “The Everest of the Desert” at over 2000m above sea level. Located just outside Ica, which is also the nation’s leading and best wine producer. 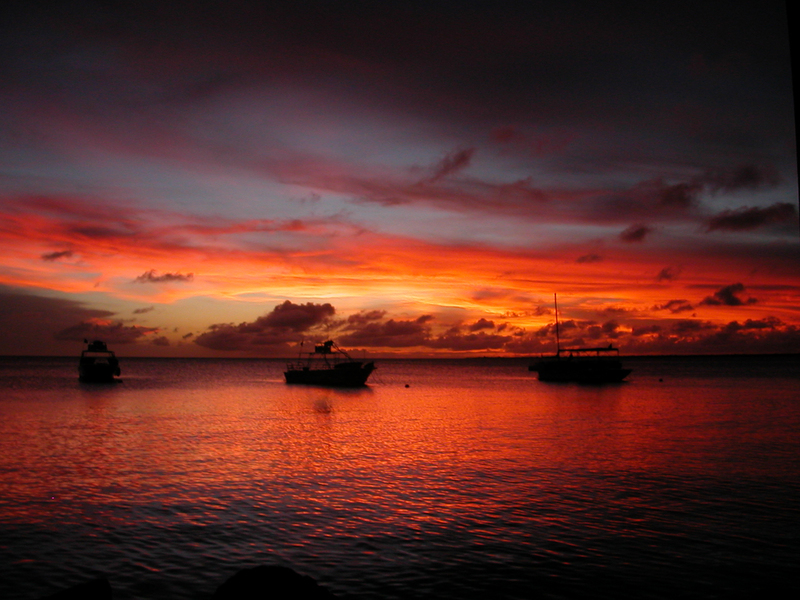 We took advantage of the fuel stop in Bonaire, an island in the Leeward Antilles in the Caribbean Sea, on the way home and stayed for a few days relaxing with these sunsets! What you find in Peru encourages you never to underestimate others. A place, that teaches you that the impossible, is possible. I would love my boys to experience that. Peru was and is mysterious, magical and special. 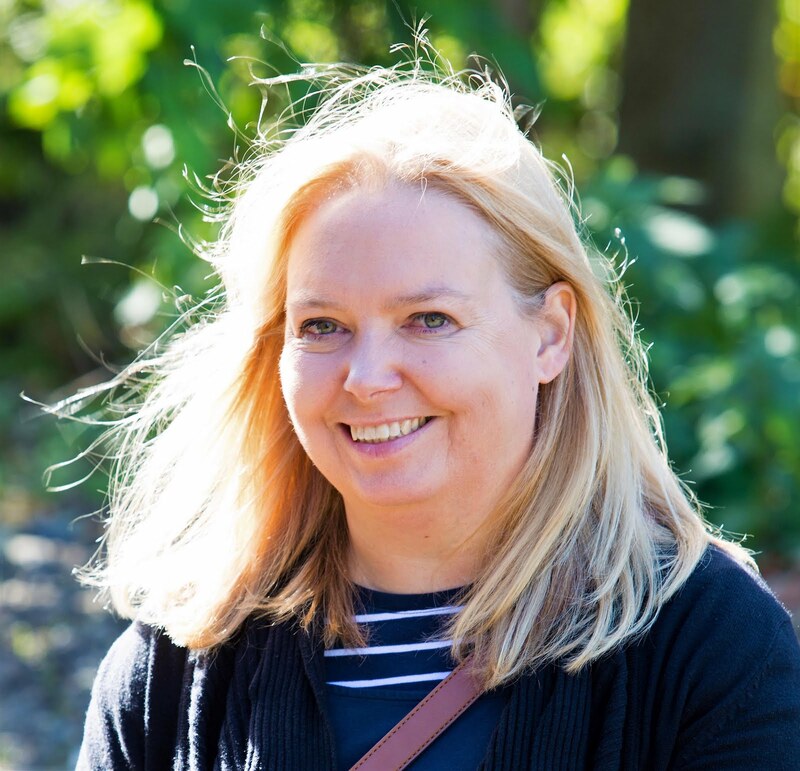 I was later to find out that it nearly became an even more special place we should have become engaged at Machu Picchu – unfortunately, an illness put these plans on hold, but only for a few months – more of that another time!. Have you ever been to Peru? What a fab experience! Here's me too scared to even go outside the U.K. Lol! Looks so beautiful! Would love to visit one day. Really is a beautiful country. I have never been but Peru is on my list. I would love to see the Nazca lines. Your photos are beautiful and it sounds like a fascinating place. I can see why you would want to take your children there one day. Wow, it looks so incredible. My best friend is currently teaching in Lima and we'd love to visit with our boys! If we do I'll be sure to check out your recommendations! I've never been, but it looks beautiful. Your life before children always amazes me, love the series! I've never been to Peru, or actually heard much. I did watch it on an Idiot Abroad and thought it looked beautiful, and your pictures show exactly that. I'd love to visit Peru, it lookslike a fascinating country!